In Northwest Colorado, youth hunting is a way of life. The opportunities for youth hunters, or youth interested in getting involved in hunting, are endless. Randy Hampton, a spokesman for the Colorado Division of Wildlife, said youth can participate in a wide variety of programs that the DOW offers, as well as programs that other private organizations offer to support youth hunters. Youth programs include a waterfowl hunt, a dove hunt, pheasant hunts, learn-to-fish clinics and opportunities for small and big game hunting. “We really try to work with the young people who might not get a chance to get out there,” he said. In recent years, there has been a national decline in the numbers of young hunters that get involved with the sport, usually because they don’t have the opportunity or support to get started. Hampton said the DOW and other organizations like the Colorado Mule Deer Association and Rocky Mountain Elk Foundation are working to attract youth to the sport and keep them interested. “Our goals are always to look at how we can bring young people into outdoor recreation,” he said. 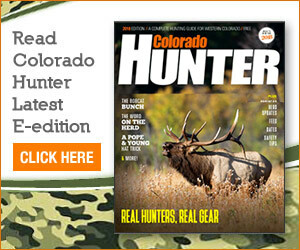 Hampton said that all Colorado hunters, including children, are required to take hunter education classes. The classes cover basic safety procedures and hunting guidelines. Since 1995, the state has offered low-cost hunting and fishing licenses to those 16 and younger. They can purchase small-game hunting licenses for $1. There is no minimum age for the license provided the applicant meets all hunter safety and education requirements, including completion of a hunter education course and possession of a valid hunter safety education card. Youth younger than 16 are required to have someone 18 or older accompany them. The adult does not have to hunt, he or she just needs to accompany the youth hunter, Hampton said. For youth looking to bag larger animals such as elk, deer and antelope, a youth big-game hunting license can be purchased for $10 for Colorado residents and $100 for nonresidents. The same education requirements apply to the big-game hunting licenses. Only children 12 to 15 are eligible for the big-game hunting license. Children 11 and younger are not allowed to hunt big game in the state and ages 16 and older are considered adults and are required to purchase a full-priced big game license. Hampton said that as much as 15 percent of the number of licenses established for each game management unit are reserved for qualified youth applicants to encourage their participation in the sport. Stan Johnson, the Northwest Colorado Division of Wildlife education coordinator, said the DOW offers a variety of free hunts for youth who are interested in learning how to hunt or interested in getting some practice. The free hunts include guided hunts for deer, elk, duck and pheasant. Interested youth can access an application for the hunts on the DOW’s Web site at http://wildlife.state.co.us/hunting/. Any youth accepted into the program is required to bring a parent or legal guardian. “We can promise a first class hunt, but we don’t promise a bag,” Johnson said.